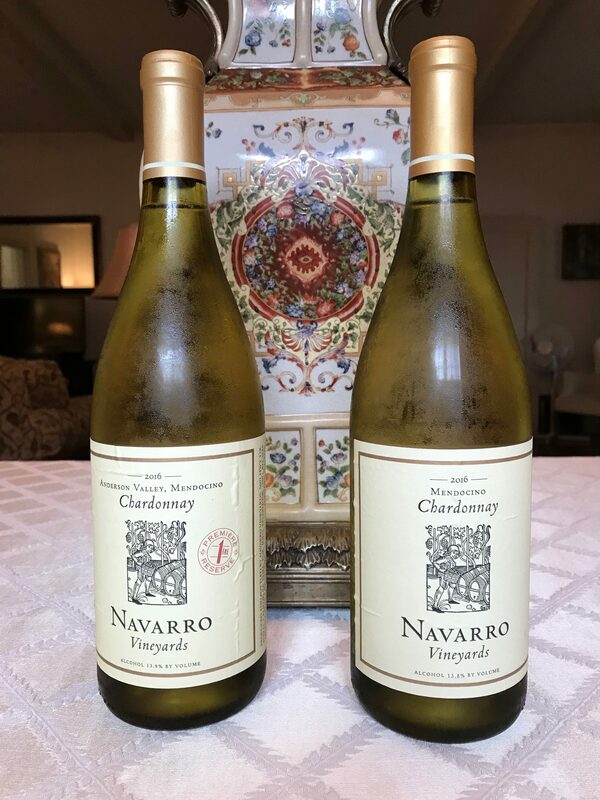 Because Navarro Vineyards makes so many chardonnays, and my sister was kind enough to give me two bottles out of her wine club shipment, I thought it would be fun to try a couple of their most popular ones in a side by side tasting: 2016 Anderson Valley Chardonnay Premier Reserve and the 2016 Mendocino Chardonnay. The 2016 Anderson Valley Premier Reserve was made from grapes grown in six different blocks from three vineyard sites. The Navarro philosophy is “complexity is more interesting than a singular flavor,” and I agree. Light straw in color with hints of poached pear in the nose, I found this wine to be surprisingly delicate, almost elegant. Despite the use of French oak barrels and a primary and secondary malolactic fermentation, this is not a pronounce, oaky, buttery chardonnay. I tasted flavors of pear, red apple crisp and crème brulee. 13.9% in alcohol, the mouthfeel was soft and light on the palate. This chardonnay would pair well with grilled lobster or a roasted chicken with thyme and oregano. The 2016 Mendocino Chardonnay was also pale yellow in color. Produced from nine separate lots from four vineyards sites in the warmer climate of Potter Valley, only 25% of this chardonnay went through malolactic fermentation. Higher in acidity than the Premier Reserve, this chardonnay is lighter, crisper, yet more fruit driven, and thus more flavorful to my taste. I detected hints of stone fruit in the nose, lemon and pineapple in the taste. With a polished style, lighter mouthfeel and softer finish than the Premier Reserve, this easy drinking wine pairs well with food. I recommend a soft creamy cheese like brie, grilled trout, or even a pasta with a light cream sauce to pair with the Mendocino Chardonnay. Lucky for me, Gary and I are headed to Navarro over this long holiday weekend. I not only get to replace the two bottles we just drank, but I get to sample the other five wines on their tasting menu. Have a happy and delicious Labor Day weekend!